According to a study conducted by Homeopathic Research Foundation — a not-for-profit organization working in the city of Lucknow,India,-'Emotional Stress' is the cause of disease in every third patient of Poly Cystic Ovarian Syndrome (PCOS). Emotional stress triggers hormonal imbalance in women to cause problems like PCOS," said Dr Girish Gupta, principal researcher and homeopathy practitioner whose work has been recognized by the ministry of AYUSH. 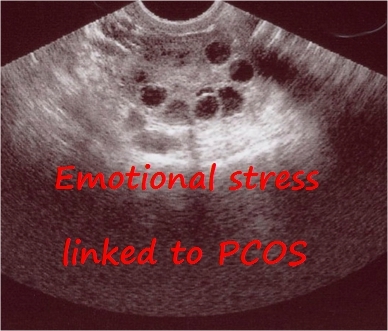 The "connection" between PCOS and emotional stress came to fore when the researchers studied the impact of homeopathic medicines on the treatment of PCOS. The team studied 218 subjects over the past decade. Outcomes suggest that homeopathy helped in resolving symptoms of PCOS in over 70% of the patients. "The results, which showed complete resolution of a cyst in 68.8% females and reduction in 19.2% females, were verified and attested by medical practitioners and documented through diagnostic methods," said co-author Dr Richa Singh. The researchers claimed that all patients of PCOS were examined on a medical psycho-social scale to ascertain the exact cause of hormonal imbalance. "Emotional stress was found to be the root of trouble in one-third of the cases," Dr Gupta told TOI. Homeopathy, he added, believes that emotions initiate, precipitate or aggravate illnesses. Additionally, the root cause of most illnesses is primarily related to exploitation of emotions. "We are now working on triggers of emotional stress in females in the 15-29 years age group. Preliminary results indicate that pressure to perform well in school or boards or crack a certain professional exam, failure or dissatisfaction in a romantic relationship, inability to strike a balance between home and office fronts or role-conflicts (failure to be the perfect daughter-in-law while struggling to excel in office) triggered hormonal imbalance in many girls," said Dr Gupta. A condition that causes formation of several small cysts in the ovary that enlarge over time and produce excess androgen and estrogenic hormones, PCOS affects every fifth woman in Lucknow in the 15-29 years age group, according to Lucknow Chapter of National Association of Reproductive and Child Health of India and Lucknow Obstetrics and Gynaecology Society. The imbalance manifests as irregular menstrual cycle, obesity, excessive hair growth on body, acne and infertility. Offering a solution to the problem, the experts suggest management of stress and emotional counselling besides medication. "While medicines can help in addressing bio-physical issues, stress management or counselling would heal the psychological arm. Together, they would help in getting rid of the disease," said Dr Gupta.